How do I choose a scuba and snorkeling mask? With today's state of air travel and airport security, scuba divers often have to decide how to travel with all their dive gear. For those scuba divers who plan to rent all their equipment at their destination, this isn't an issue. However, the trend in diving has always been that as divers become more experienced with more dives logged after initial open water certifications, they tend to want to use their own equipment rather than rent. This is especially true with masks, regulators, wetsuits and dive computers. 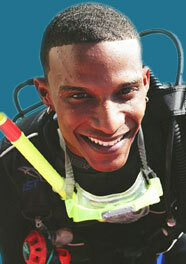 Avid scuba divers will often travel with their entire gear including fins and buoyancy compensators. Of course because of weight issues, scuba divers rarely travel with tanks or weights. I have an air integrated Oceanic scuba dive computer that I wouldn't want lost or delayed in checked luggage during my dive trips so I always carry it on with me on airplanes. I have never had any problems going through airport security. Sure, they might check my stuff because scuba dive gear looks pretty foreign to most airport security staff but that's okay as my scuba dive computer always got through. The only thing I have to be careful of is how I pack it. On a few occasions, I had put the computer in a soft bag that also contained my regulator, another piece of my own scuba equipment that I would prefer to use rather than deal with a rental. During travel, one of the buttons on the dive computer must have gotten accidentally depressed which activated the device. Because of the altitude and/or pressure changes during a flight, the dive computer thought that it was going on an actual dive. It started beeping because it didn't like the statistics it was sensing which was a bit annoying on board. After the flight, my dive computer actually locked out for 24 hours. It was a good thing that I didn't dive until the next day. So from now on, I always pack my scuba dive computer in a box which prevents accidental activation and then the box goes into my carry on baggage. I also carry on my mask as well as my log book and certification cards. I wouldn't want to be refused for diving by a dive operator in case my checked baggage was lost so it is highly recommended to carry your log book and certification card with you. Everything else like my wetsuit, booties, fins, snorkel and buoyancy compensator goes into my checked baggage. If my checked baggage is lost, stolen or delayed, I can always rent the extra equipment I need without losing any dives. Some folks believe that one should not check in any large scuba dive bags with the dive flag displayed as it may advertise luggage containing expensive dive gear. In this case, one can always pack a flexible scuba dive bag inside a larger regular suitcase. So a good rule of thumb to use is to always carry on the scuba dive equipment that you can't afford to lose or be without for your diving and check the rest. Clint Leung is a NAUI certified Master and Rescue Scuba Diver. He is also owner of Free Spirit Activewear (http://www.FreeSpiritActivewear.com) , an online retailer and designer specializing in premium quality activewear with specialty sports themes including scuba diving, skiing, snowboarding and martial arts. Free Spirit Activewear has numerous information resource articles on selected specialty sports as well as free eCards.